I am trying a new experiment. I am very short on straw for the animal pens. I am saving what I have for baby piglets this winter. I tried to find sawdust, but that too eluded me. Then, I came across an opportunity to use woodchips. I have not tried them before, but them seem to be working out pretty well. I will be more informed tomorrow when I clean the pens. The chips will provide carbon, like the straw, to absorb the free nitrogen in the animal manures. I just don’t know how absorbent they will be. Perhaps I will need to use a larger quantity. I know that they will compost slower than the straw and have a little lower pH, but they are free. I will use them carefully making sure the animals especially the horses don’t eat them. I use them in the tie stalls for the drafts, so I don’t see a problem. I think I will use some lime stone in my compost pile to help offset any negative impact, but first I need to see how they work. The cow’s sleeping area is piled thick with the chips. I let the sows out every day to root through the bedding. This rooting is incorporating the manure while fluffing the cow’s bed. 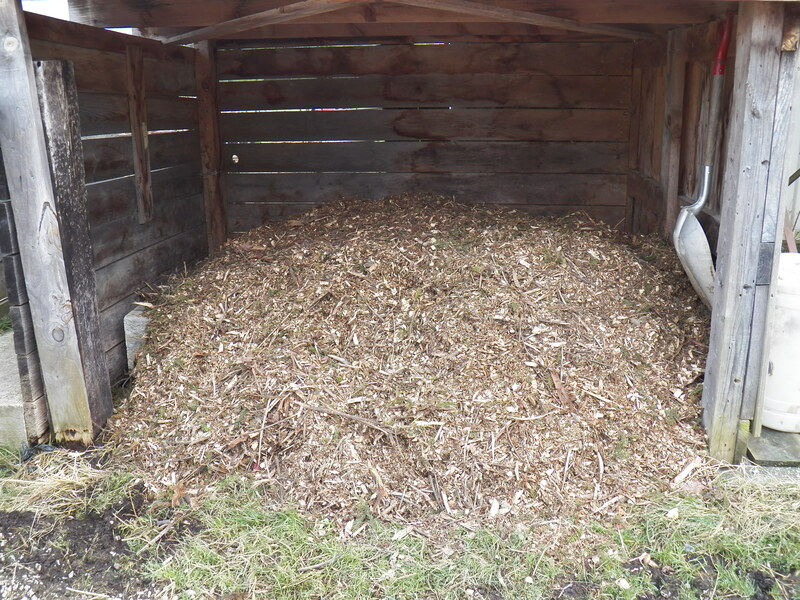 I am thinking that as the rotting/composting process starts, the cow’s bed will be a warm place to lay on a cold night. It has been a cold last few days. Today was no exception. The thermometer said 24 F, but the wind made it feel much colder. I was in the work fast, drink hot beverage, pee a lot, mode all day! It was cold on hands and face, body not too bad, but fingers made up for it. Gloves on all day, but when they had to come off to do something, these poor old fingers felt it. Two neighborhood young men came today to help me move a pile of rubble. The rubble will one day be a big hump in the woods. That big hump will provide an unloading zone for maple sap. 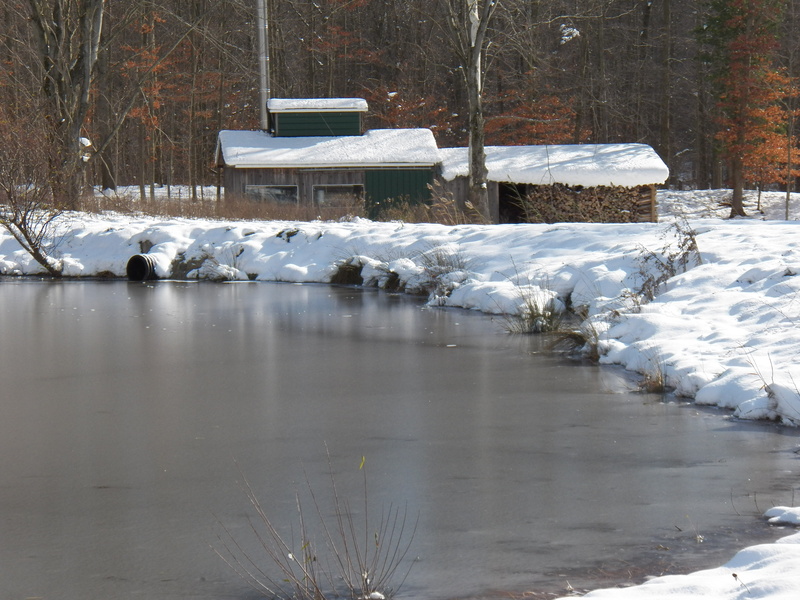 I can unload by gravity, then pump the sap to the sugarhouse. This project may take me a year to complete, but the base has been made. It was a cold day to do it, but I am glad that it is done. 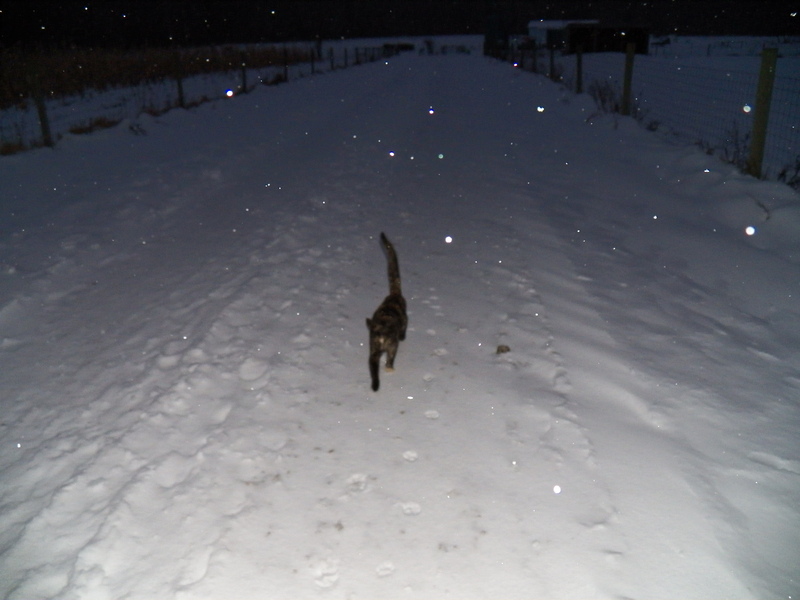 Every night when I bring the cows up, the cats come along too. It started by walking the dogs down the lane. The cats wanted to go. So, now every night, when I head down the lane, two dogs and two cats help bring the cows to the barn. Herding cats is like trying to nail Jello to the wall, but a cat that herds cattle…priceless! Tonight as I went to bring the cattle in, my gang of herders trailed with me. I got to the gate, called the cows and everyone headed to the barn quickly. 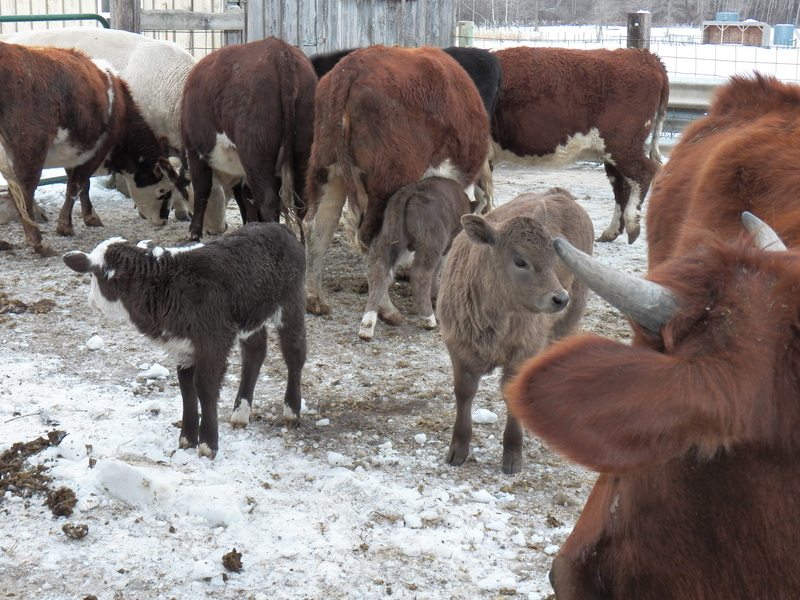 Everyone that is, except the new gray, white-faced calf. Her momma took off with the rest of the herd, but she stayed put. My trusty companion Cinch, the border collie, laid down right at the gate. The little calf would not go near the “wolf”. I tried to convince Cinch to come with me. He dutifully did just that…scaring the crap out of the calf, literally and figuratively 😮 The little calf ran for the thorn apple thicket. We coaxed her out and to the gate twice. Every time we got near the gate, Cinch would lay in the opening and the little calf would hightail it back to the thicket. Darkness was closing in and I am not the running cow herder I once was… So a new plan was hatched. Cinch, the cat and I went to the barn to get the cows. I named the little calf “Shirley” .. for surely you have got to be kidding me! The calf’s mom and the rest of the herd went back to the field. Mom and baby had a great reunion. Mom was much more interested in grain just moments ago, but now her baby was her only focus. 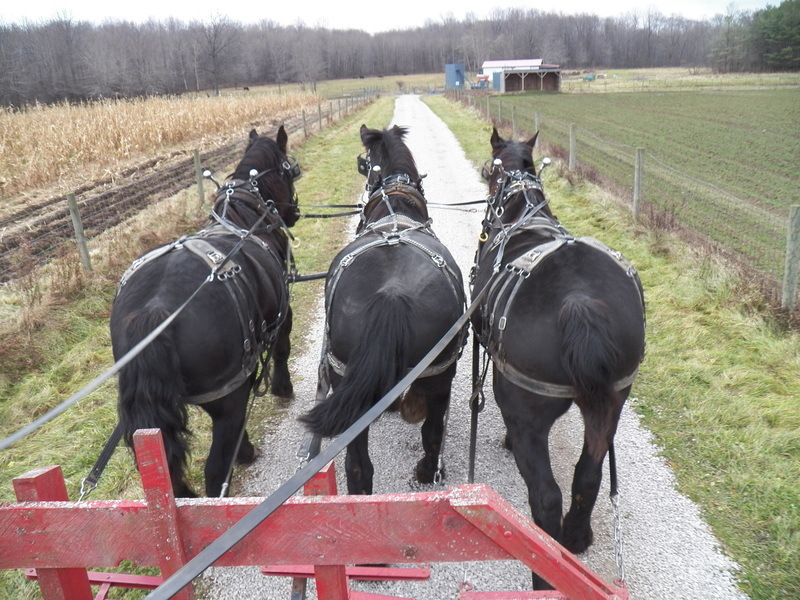 The gang reunited, I marched them all back to the barn again. The three little calves led the way. Cinch the cat and I brought up the rear. After a very cold night, it stayed a very cold day! This little heifer calf was born three days ago. I am sure she is wondering what the heck happened. Three days ago she was in a temperature of 101 degrees. This morning it was 8 above zero F. She spent the night with the cow herd under the protection of our barns overhang. 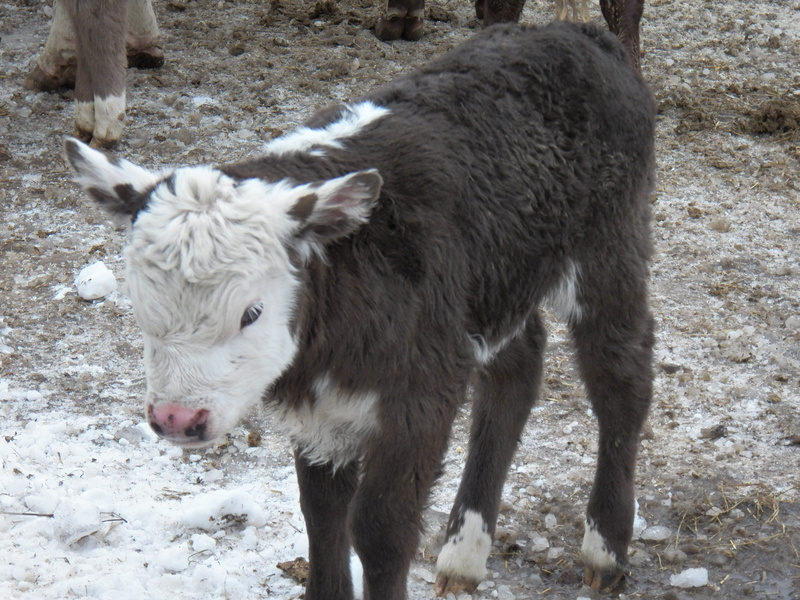 She woke this morning ready to play with the other calves, like most children, paying no attention to the cold. I worked all day making sure things were ready for the winter that has descended upon us with a vengeance. I added bedding to the little pig’s pen. I cleaned the horse barn twice. The first cleaning was like shoveling marbles. The roadapples were frozen ankle twisters, much better in the compost pile than underfoot. The gilt’s pen was okay. The big girls know to make a nest and snuggle into it with their roommates. The little pigs are learning fast and were even covering up after chores tonight. Lake effect snow is forecast for tonight, but it looks like most of the white stuff will stay north. The cold however, is here to stay, at least for a while. The cow’s stable is fluffy and dry. They just lie and chew their cud, content to be waiting the storm out. I guess I will just be patient too. My work will wait for better days. After all, I can work in 8 degrees in January, but in November…. I’m a wimp! Yep, they said it was coming…it’s here! 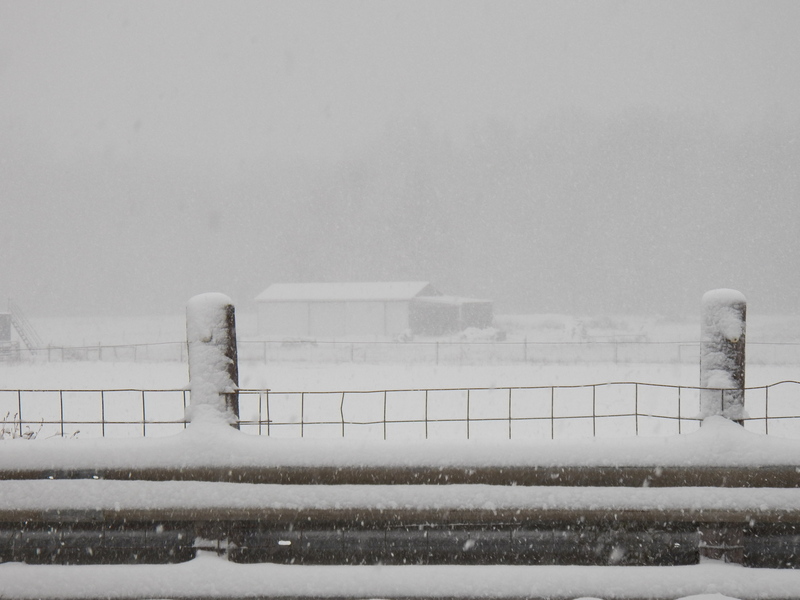 Over four inches in the last couple of hours. They say the storm will hang around a while, so ready or not, here it is. 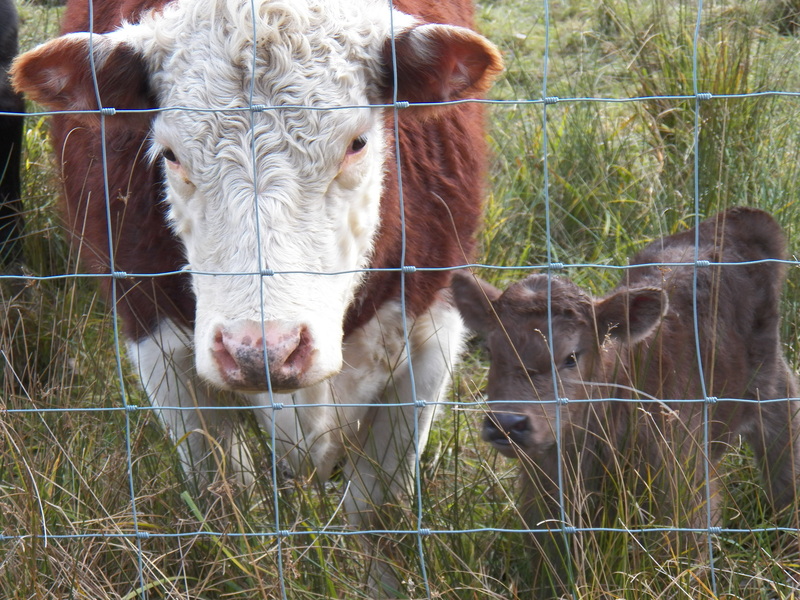 I went down to the pasture to check on the cattle and the new babies. When I got there, they checked me out. Well, maybe it was the dogs who were being watched, but the little one was not missing a beat. Have you heard, the first snow of winter is supposed to hit us in the next few hours. It feels as every creature here knows that it is coming. The cats were curled up much of the day in the straw. The piglets pushed their bedding into a big pile and were stacked like cordwood underneath it. The horses have big appetites and the young sows, like the piglets, have fluffed their bed for the night. I had trouble trying to pick corn with the picker. It is simply too muddy in one field. In the other field, I managed to slip a chain off a gear in the worst part of the machine possible. I will repair it, but believe I will start picking the corn by hand. The little bit I did gather in looks very lonely in the crib. The rest stands in the field, braced for the storm, hopefully it will stand up to the wind and weight. I worked on firewood for much of the last two days. I just don’t get as much done as I did when I was younger. I don’t get it. I’m just as tired at the end of the day as when I was young, but when I look at my progress, there is much less. This afternoon, I even took a nap! 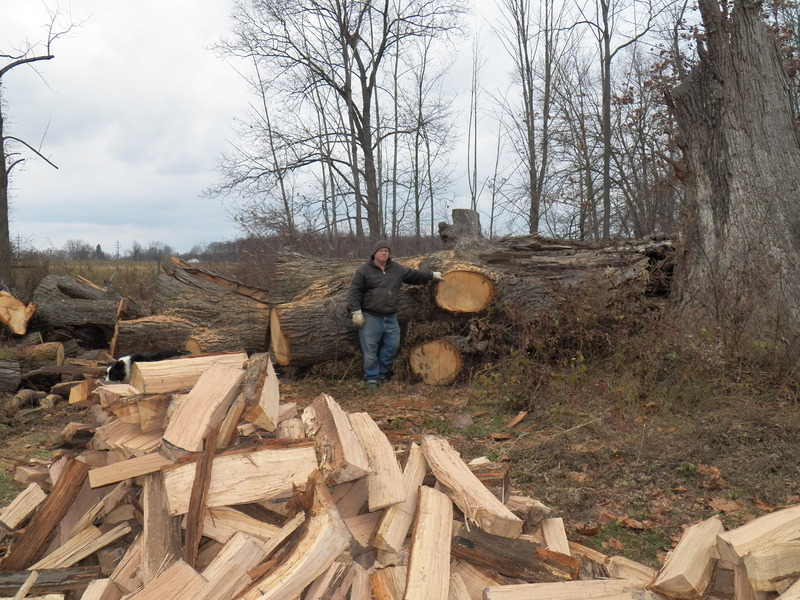 I know that I have laid a lot of ground work, so when the wood starts coming out there will be plenty. I guess I will celebrate then. For now, I will wait and watch for the snow storm, make repairs and keep my chainsaw ready….it will work out…it always does!